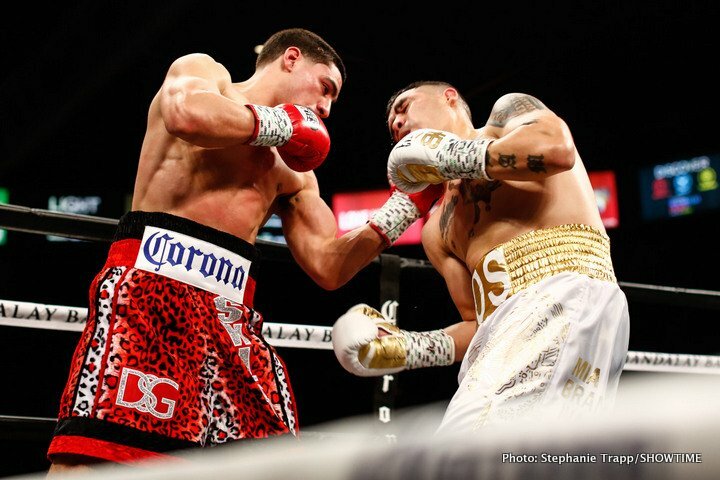 Last night in Las Vegas, former WBC welterweight champ Danny Garcia iced a game (if faded) Brandon Rios in fine, highlight reel fashion. The ninth-round KO “Swift” scored is arguably the most impressive, certainly most eye-catching, fight termination of his since his destruction of another faded former champ in Erik Morales, who Garcia KO’d in 2012 (forget the hatchet job Garcia did on the hopelessly over-matched Rod Salka in 2014). Known for his excellent left hook (the punch that accounted for the demise of Morales in the rematch and for Amir Khan) Garcia unleashed a killer right hand against Rios. Now back in the picture for big welterweight fights, Garcia has options. A return with Keith Thurman is something Garcia, 35-1(21) wants quite badly (even though most fans feel Thurman beat Garcia pretty badly back in March of last year; Garcia himself is stubbornly insistent he got the better of things), while Shawn Porter would like a fight with Garcia. Has the 29 year old from Philadelphia got the hunger back? Back in 2014, when he beat up dangerous puncher Lucas Matthysse (Garcia’s best-ever performance according to many judges), Garcia looked nothing short of sensational; a future superstar. Up at 147, where he has boxed just a half-dozen times, Garcia hasn’t looked as good, as fast, as powerful. But has Garcia got his mojo back now? It’s hard to tell, seeing how faded Rios now is – and Rios was winning rounds last night, no doubt about it – but one thing is clear; there was nothing wrong with the power and accuracy of the sweet shot the former two-weight champ uncorked to end matters last night. Can Garcia improve on his first fight with Thurman? Might Garcia and Porter hook up and give us a great action fight? Looking at things now, Garcia is far from finished. Let’s hope he fights again soon and keeps up the momentum and the buzz he generated in Vegas last night. As for the game but ultimately vanquished Rios, 34-4-1(25), the 31 year old needs to call it a day. Rios thrilled us over the years but his best days came back in 2011 to 2014. Previous boxing news: What next for George Groves, Chris Eubank Jr?